Bringing together a diverse range of professional tone tools for the very first time, the Waza Tube Amp Expander elevates the tube amp experience to an amazing level of versatility for stage performing and studio recording. This device does it all -- it's a variable reactive load box, active analog power stage, mic'd cab emulator, IR loader, and recording interface, all in one integrated unit that's road-ready and easy to use. Backed by Boss' advanced Tube Logic approach, you're able to crank your amp to its sweet spot and play at any volume while faithfully retaining the core tone and feel you love. And with extensive connectivity, built-in Boss effects, 10 fully customizable rig setups, and deep real-time control, you have unparalleled creative command for any scenario. Packed to the max with breakthrough Boss innovations, the Waza Tube Amp Expander is an essential companion for every tube amp player. Realized with Waza R&D expertise and the ever-evolving Tube Logic approach, the Waza Tube Amp Expander seamlessly complements and extends your tube amp, and all without affecting the unique tone and response that made you choose it in the first place. The initial concept for this unique device came during the development of the flagship Waza amplifier head. To comprehensively test and refine the amp's AC power voltage and output circuitry, the Boss team devised a custom load box with capabilities reaching far beyond those in any commercially available unit. This innovative design performed so successfully that it became the logical foundation for developing a next-generation toolkit for the modern tube amp player. As a tube amp owner, you know that it sounds and feels best when it's cranked up loud and really cooking. But if you're like most of us, it's a rare pleasure to be able to open up the volume enough to unlock that full expressive potential. Load boxes and volume attenuators driven by a tube amp's speaker output have attempted to solve this nagging volume issue for years. But while they do lower the volume and provide workable results, they typically introduce artifacts that change the tone, dynamic response, and distortion character, leaving you with an unsatisfying experience. The Waza Tube Amp Expander's advanced reactive load section completely eliminates these artifacts, allowing you to experience your amp's true cranked-up sound and interactive feel while controlling the volume to suit any situation. A key feature is the Resonance-Z and Presence-Z panel controls, which optimize the all-important impedance interaction with your amp's output transformer. Selecting from sixteen different settings, you can make your amp behave and respond exactly as if it were connected to your favorite speaker cab. Any tube guitar amp up to 150 watts is supported, from vintage combos to modern high-gain heads. Filled with deep control options, the Waza Tube Amp Expander is a dream command center for both stage and studio. Ten different rig setups can be stored in the unit, and each includes your custom effects and EQ settings, cab/IR selections, effects loop on/off, MIDI program change (for controlling external MIDI effects), and amp control status (if you have an amp that supports channel switching). 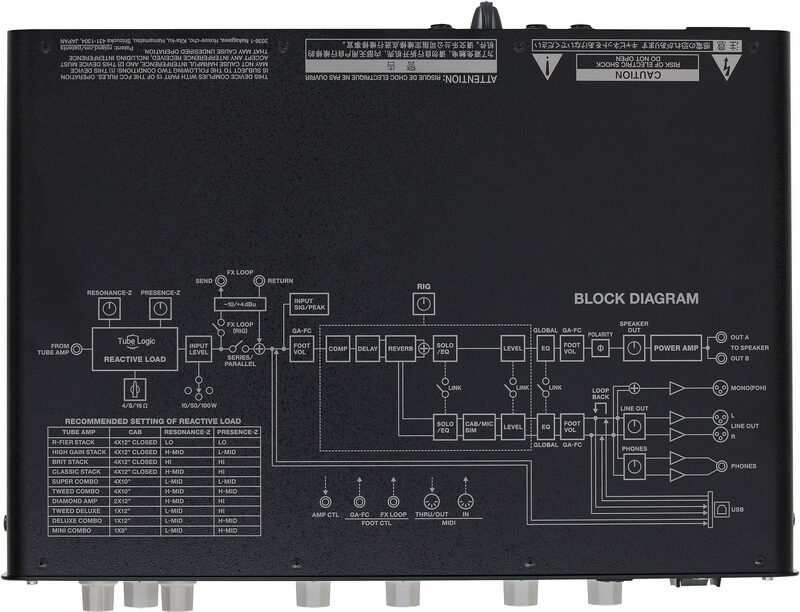 Rigs can be recalled with a panel knob, and additional controls are provided for reverb and other functions. There's also a Write button for saving minor adjustments in the heat of a gig. With its built-in effects engine and external effects loop, the Waza Tube Amp Expander brings a wealth of sonic enhancements to your tube amp, particularly if it's a vintage model with no effects loop. Onboard DSP delivers premium sound quality and true stereo operation with class-leading 32-bit AD/DA, 32-bit floating-point processing, and 96 kHz sampling rate. Compressor, delay, and reverb effects are on hand, with loads of customizable settings via dedicated editor software. Four different EQs are available for strategically shaping your tone at multiple points in the signal path, and it's even possible to use one of the EQs as a switchable boost for solos. The external loop offers selectable series or parallel operation, plus support for both line-level devices and standard stompbox effects. Once you've dialed in your amp to the sweet spot, the Waza Tube Amp Expander lets you deliver that glorious sound to multiple destinations at once. With parallel speaker outputs, you can drive up to two stage cabs from the integrated 100-watt Class AB analog power stage. Along with providing smooth, non-stepped level control for any connected amp, this robust power stage also opens up the ability to boost a favorite low-wattage amp to stage-ready volumes. Balanced mono and stereo line outputs include tone shaping from mic'd cab emulation or user IRs, providing ready-to-mix direct signals for the main PA mixer, stage monitors, and recording devices. There's a USB output as well, offering another direct feed for tracking with your preferred music production software. And with the dedicated phones output, you can practice with great tube tone without disturbing others nearby. The Waza Tube Amp Expander works great out of the box, but connecting to the dedicated editor software via USB unlocks even further creative potential. First off, you're able to edit effects and EQs in micro detail. In addition, you can select from 22 different mic'd cabs for the direct outputs, each with your choice of five adjustable close-mic types plus three room-mic types for adding spaciousness and depth. There are even four user slots for loading your go-to speaker IRs if desired. Other tweaks are available too, including MIDI, system parameters, and a loudness contour for big, full tones at whisper-quiet levels. Favorite rig setups can be saved on your computer and organized as Live Sets for different gigs and recording scenarios.